There is something to be said for having a "buy-in character" for various groups in works of entertainment. Those characters that an audience member can see a little bit of themselves in. One type of these characters that I never really liked was the kind that was only there for kids. More often than not, these characters were either useless or annoying. Sometimes both at once. 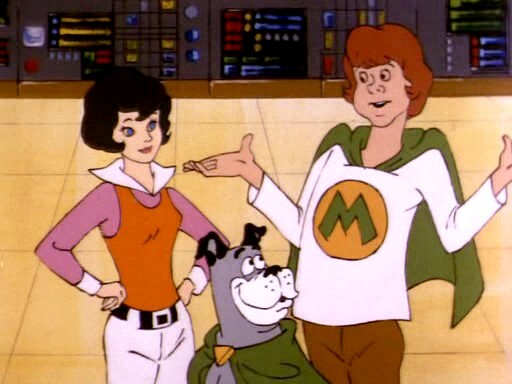 Some examples I can think of would be Wendy, Marvin, & Wonder Dog on the original Super Friends. These "Junior Super Friends" were there simply to give kids a reason to watch the show. Yes, Hanna-Barbera Productions thought that a cartoon about Superman, Batman & Robin, Wonder Woman, and Aquaman wouldn't have kids watching it. Ugh. Another type of character was the "Hey kids! Watch this! We've got a kid on here who's super smart!" character. I'm talking about the Wesley Crusher/Lucas Wolenczak character. You know, the kid who's smarter than the adults. The one who can figure out the solution to the problem quicker and better than the highly trained officers. Yeah, that's something I have no time for. Don't get me wrong, Wil Wheaton & Jonathan Brandis did a great job with what they were given, I just don't think those are the right kinds of characters to have on shows. I would much rather have watched Star Trek or SeaQuest without those characters on them, or have them there but just as regular kids their age. The Super Genius (TM Wild E. Coyote) bit is what made me not like them, and their over use as the Deus Ex Machina made me dread episodes that featured those characters. Personally, I would much rather all characters be there for a story purpose, and not to attract a certain type of viewer. Series like Firefly had a great range of characters and not a kid among them. Not to mention the original Star Trek, where kids were guest stars but not regulars. I'm pretty sure the show was fine in the under 18 demographic, even with that "lack" of someone the kids could identify with.